Omnes nationes servitutem ferre possunt: nostra civitas non potest. From this we can draw the first use of the word nationes, which would evolve through Old French to become the word nation by it's first, modern use in respect of the Byzantine emperor in 968AD. and the civitas which he regards as the body of the Empire. 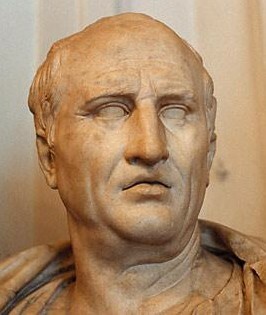 Sovereign states based on the model of nationhood - division by religious or racial boundaries (as we can read from Cicero) only begin to appear after the Roman Empire and are only referred to in these terms by the late 17th century. Historically, political borders would have been impossible to lay down due to the debatable and inaccurate nature of contemporary cartography and so major cities and geographic elements provided the markers and bastions of a 'nation.' Some of these markers still exist today where borders run along rivers or ravines while others, such as those of the New World are more arbitrary and still others are given by hyper-real markers, Korea's 38th parallel being one prominent example. The vague, borderless forms preceding the medieval state based their definition on the range of militaristic and civic control, and so the Roman Empire could simply maintain control by placing legions in 'outer' cities or bastions and thus use these positions to define their borders. The Roman Empire can't be considered an empire on parallel terms to the British Empire or any other 'empires' of the period of nations. The Roman Empire was the totality of civilisation, representing the first unified civitas of multiple nationes. Following empires simply reclaimed other nation areas, imposing their own civic rule upon them. Nationalism died as deciding force with then end of the Second World War. The Cold War was fought on ideology regardless of nationhood and race and it follows naturally that in an age of multiculturalism, globalisation and the Internet that borders of the kind laid out after the disintegration of the Roman Empire are outdated and irrelevant memorials to the brief period of nationalism that gripped the world from the medieval period to the beginning of the Cold War.